Deciding to go to a Formula 1 race weekend is a big deal, and if you’ve never done it before it can feel like taking an (expensive) leap into the unknown. After my first F1 weekend to the Belgian F1 in 2013, I decided to write a short guide including all the things I wished I’d known before I went. So, if like me you’re a lifelong watcher and have never been before GO; it was one of the best experiences of my life (and don’t worry about the details)! A quick Google search gives you tons of places to buy your tickets from, with prices ranging from £100 to £150 for general admission depending on where you go. I’ve previously bought them from the weirdly named Gootickets, as they were the cheapest. Pick-up was easy, they have a building in Francorchamps that’s only 5 minutes walk from the track entrance nearest the pit entrance and F1 village. You need ID for the person who picks up the tickets but it was all really easy. I’ve also purhcased from BookF1, which had the added bonus of the option to also purchase a pitch at the trackside campsite. This site couriers the tickets to your home address and allows you to specify the last date they can arrive. They do say that most circuits print tickets between two to four weeks before the race. Travelling from England, there’s a couple of options: driving, flying or going by train. We drove and the easiest way to do this is to get the ferry from Dover to Dunkirk. We used Norfolkline and if you book early you can do the trip for about £70 return in a normal-sized car. The trip’s pretty quick and the ferry has got all the usual restaurants, bistros and duty-free shops. Beware though, you’ll be paying through the nose for food on here we spent £25 on two rather rubbish fish and chips and a hot drink. Once in Dunkirk the drive couldn’t be simpler. The E42, a European road route which links loads of the motorways (A-roads), goes all the way from Dunkirk to Francorchamps. Plan in a bit of time for roadworks, we spent most of the journey cruising at 50km a hour. Here’s the map route you’ll need. 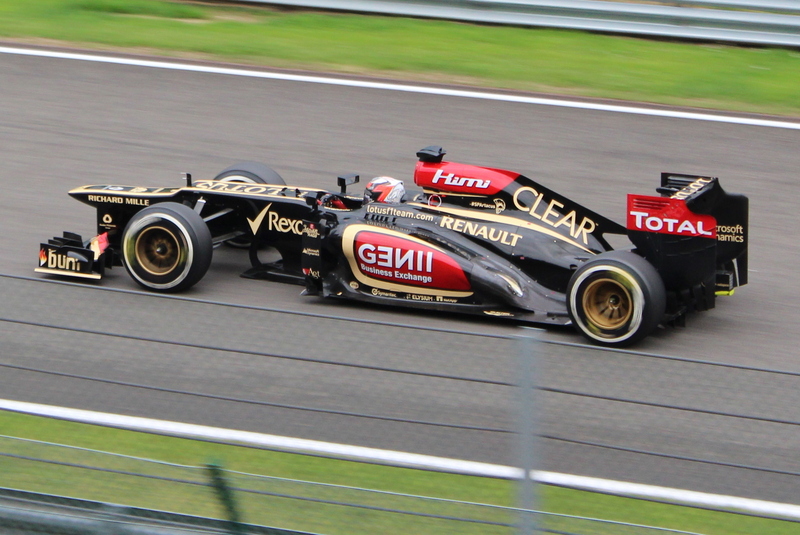 We stayed with Camping F1 in 2013 and 2014, at a site a couple of junctions down the E42 from Francorchamps. The camp site appears only for the F1, so expect a a row of vans with toilets and showers rather than the usual block you get at most camp sites. It also had a marquee with a bar, burger van and music played until about midnight (plus some pretty bad karaoke). The site does pre-erected tents but we took our own, but this did mean we didn’t get the ‘full package’. That meant no access to the free breakfasts they do on site, or the free bus service to the track. We actually tried a different campsite in 2015, the Green Zone Campsite that is offered trackside. The campsites are literally fields around the track, so they are pretty basic. There’s a water tank but definitely take your own supply. There’s not many portaloos, so expect a bit of a truck through the dark to get the the facilities. We were also on a slope, which made pitching the tent a bit difficult. However, saying all that we are going to stay there again in 2016. It is so close the track that it’s a 2 min walk to get onto it and whilst doing so you walk through the craziest campsite! The atmosphere here is incredible; much more like a music festival so expect loud music until 5am, fireworks going off, lots of singing, pop up bars and lounges. It was a brilliant addition to the craziness of the F1 weekend experience. If you’re not staying trackside, you will have to travel in to the race, but don’t worry; the nearby villages of Stavelot and Francorchamps know what they’re doing when it comes to F1 season. We drove to Francorchamps and didn’t experience any traffic jams. Random fields and people’s gardens become car parks for the weekend, costing 10 Euros a day. Just drive into any one of these places and you’ll be herded into a car park before you know what you’re doing. The walk is nothing either and it gives you a good chance to stock up on food, drink and souvenirs before you get into the track. There are so many people at the track and yet, you can always find space. Here’s a good map of the track so you can get a feel for the layout. Getting there earlier helps, though we were too lazy to be there with our chairs at 7am. We got to the track about 11am on qualifying day and about 10:30am on race day and found spots easily. Take chairs or plastic-bottom picnic rugs because the track is so massive you will get tired of being on your feet! Kemmel Straight: There’s a couple of big screens along here, the cars will be going full tilt and there’s burger, waffle and hot drinks stands along it at regular intervals. 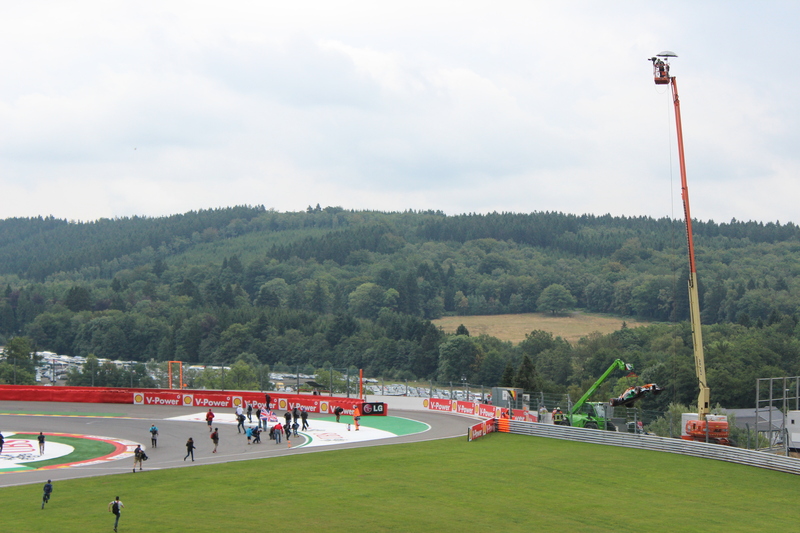 We watched Qualifying on the Kemmel Straight, just at the top of Eau Rouge and Raidillon. This gave us a great view of the car comes up Eau Rouge (you won’t believe the change in height up that corner!) and go past you at full speed, often overtaking. There’s some big screens along here, but the space in front of those fill up first. If you’re going to watch from hear take ear defenders or ear plugs. Pouhon: There’s everything here including several big screens and the usual food huts. You’ll see the cars coming downhill from Bruxelles before sweeping round Pouhon corner. Cars tend to go wide here too so you’ll see some jostling to get back on track. There’ll be plenty of changes in speed and great potential for overtaking or running wide. Eau Rouge: There’s plenty of vantage points for Spa’s most famous bit of track. Just to see the cars climbing that hill is a joy and though most of the best viewing spots are obscured by the pricey grandstands, you can still see a fair bit of on track action. Bus Stop Chicane: Our choice for race day as it had everything. You’ve got the cars slowing down massively for the Chicane, you can see the pit entrance, there’s a massive big screen and you’ve also got a great view of the starting grid, the pits and podium. If you’ve got a general admission ticket you need to just find a space, we chose to sit above the Bus Stop Chicane in the trees, which gave a great view down onto the track. The added bonus for sitting here was that at the end of the race the fence was opened up and we could run down quickly onto the track, go around the Chicane, up the starting grid and watch the drivers on the podium. If you hang around here you’ll also get to have a look into the garages and see the TV crews doing their post-race interviews. We managed to get the BBC team to take a lingering shot of us behind the fences and out phones soon lit up with friends and family who’d seen us. Unlike many other motor races, there’s no access to race commentary at the track. Loudspeakers along the track give updates in English, French and Flemmish, but the noise from the cars pretty much drowns them out. Apparently local radio does do a broadcast, though hearing it will be a problem if you can tune in. If you get in sight of a big screen it won’t matter because you get the international broadcast feed as you would at home on TV. I was amazed at how easy it was to follow the race; you soon notice if a driver’s it out of sequence from the last lap. Many times I’ve been it has rained at some point during Qualifying or the Race, and not just an annoying interlude; they were full on biblical deluges. Some of the most impressive thunder and lightning I’ve seen is on the nights spent camping in the Belgium forests. If like me you take want to take food or a camera, invest in a waterproof bag or a roll of bin liners and that way you’ve got protection and something to sit on (or expect to pay 15 Euros for a flimsy poncho). There’s a reason Eau Rouge is so prominent at Spa, when it rains there’s rivers everywhere. It seems to have it’s own weather system and as quickly as the rain comes it’ll dissapear and it’s get warm. Best to pack for all eventualities as we sweated out one day in damp waterproofs! Be prepared to pay ridiculous amounts of money if you want to eat and drink at the track. They do a good job of providing burger, waffle and drinks stalls at regular intervals along the whole of the track, but it’ll cost you. Expect to pay 6 Euros for chips, 10 for a burger and 3 for a can of drink. After Qualifying we headed into a nearby town and got ourselves picnic material and drinks for Race Day and probably saved about 40-50 Euros. They don’t check your bags or stop you bringing in your own food and drink; everyone around us had hampers and picnic sets. Not only do you get the Practice sessions, qualifying and race for F1, you also get all of these for GP2, GP3 and the Porche Supercup. There is always something going on. The path that cuts diagonally across the track from Pouhon to Bus Stop Chicane and Eau Rouge is a really handy way to quickly bypass the long walk around the hilly circuit. It takes you through the beautiful pine woodland inside the track and the trees echo with the sound of engines; it’s a weirdly calm oasis in the middle of all the noise and crowds. Heading towards the Bus Stop Chicane, you will walk past the motorhomes, garages and hospitality suites belonging to the support race teams. The path also links to the Eau Rouge/Raidillon side of the track via an underpass where the F1 Village is located. This sells merchandise for all the teams and some ex-drivers, as well as a couple of racing simulators so you can try your hand around Spa. Getting out after race day was an experience, they funnel all the traffic off down tiny back roads but it means the main roads don’t get totally jammed up. It took us about 30 minutes to get back to the motorway, though the queue of traffic northbound back toward Liège was slow moving for at least 3 hours after the race. Southbound was totally clear. 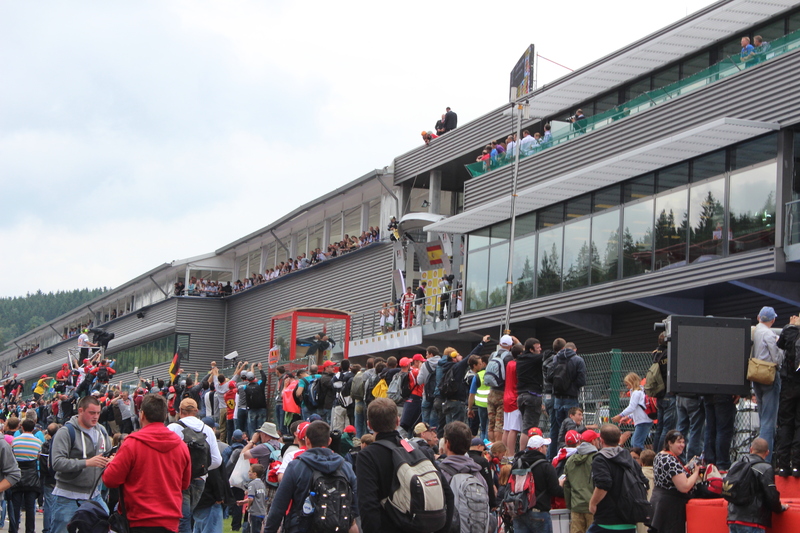 So there we go, a beginners guide to attending the Spa-Francorchamps F1. Hope it was useful! Just got home from this years race and man it was hot. Even hotter than last year, every day about 35c! Hi, Great review and advice, we had a great first time at Spa this weekend. 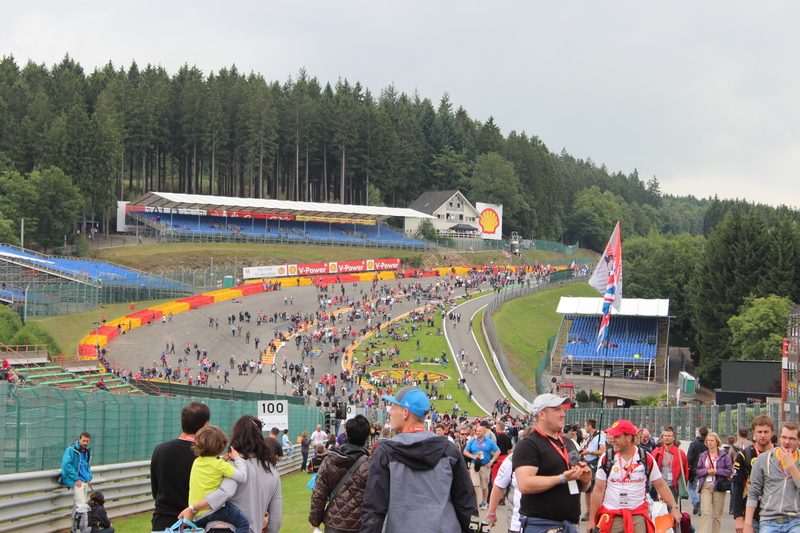 We watched from Eau Rouge, general admission, but thought Gold 3 grandstand would be a fab spot as you’d see the cars from the top at La Source, and be able to follow all the way down through Eau Rouge, seeing the elevation plus direction change when coming up the hill; great view!! we took your advice re leaving the circuit and decided to have dinner afterwards, allowing us to leave the circuit at approx. 18:30, and didn’t encounter any traffic. We’ll definitely be there next year!! Great article. We’re attending the race this weekend, and we’re staying in Liège and need to go back there after the race. When you said it took you about 30 minutes to get back to the motorway, did you mean the E42 or the E25? I was thinking of heading slightly south and heading west towards the the E25 to get back to Liège. Hi Justin. I’m not actually sure what the best sort of lens to take is, but a long lens/zoom is handy to get close shots of the cars. If you are worried about not being allowed to take your camera/big lens in don’t worry; they don’t stop you from taking things like that in; everyone has them! Hi. Where are soon going for The 2016 GP. Have bronze tickets and Staying In The green camping zone near The court. That is NOT that far from The track. Is it ? Really close, about a 5 minute walk to the track. That’s where we’re staying too! Hi, I am going again this year but am afraid I don’t know about local breweries! Its so busy at the race weekends I don’t really plan on leaving the track! One last question, we don’t get off the Euro tunnel until 17:55 local time on the Friday which means we probably wont get to the site until 21:00, would we have a problem getting on at that time? Hi. I’m afraid I haven’t stayed at either of those sites so can’t really say what they’re like. We have usually got to the sites on Friday night quite late and the only real problem is putting the tent up in the dark. The sites usually have someone there all night because people are always turning up whenever on the campsites around the track. Hi Tommy. I’m pretty sure this is the Gold 5 stand. There’s a pretty good grandstand map on the “tickets” tab of this page http://www.grandstandmotorsports.co.uk/belgian-grand-prix.html. I am coming to spa this week for the first time 😄😄😄 with my husband and son. Staying at f1 camping, really helpful to know about the supermarket location and especially about the chairs, thank you so much for the review it has been very helpful. Glad you found it useful! You’re going to have a great time; I’m eagerly counting down the days now. Thanks for the info! My wife got me tickets and a flight for my birthday this year and I can’t wait for my first ever live GP weekend! I still need to find a way to get from the town of Spa to the racetrack during the weekend, as we don’t have a car there, but I’m sure it can’t be too difficult. Hi, glad you enjoyed and good luck for your first trip, you’ll love it! And you really don’t need to worry about getting from Spa to the track, it’s really close and all the rounds are streaming with people heading towards the track so you’ll never get lost! Hiya, We’re going to Spa in two weeks and staying at Camping F1 🙂 I can’t really find any other people that have written about it so I hope you dont mind me asking a couple of questions? I know you said you didn’t walk from the campsite to the track but do you think it would be doable? Google maps seems to think it’s about half an hour in a straight line….also a review on tripadvisor said the campsite isn’t at the address they say on their website, so I just wanted to check this is wrong! Thanks in advance, and thanks for the guide! Hi Kayleigh. I really don’t think it’s possible to walk from Camping F1 to the track, there isn’t any paths and it’s through woodland. It would take a long time to get there and finding a way would be difficult. If you’ve got a car, there’s tonnes of parking in all the villages all round the track and it’s only costs 10 euros a day. There’s traffic, but it’s always moving and we’ve always managed to find plenty of spaces. Fingers crossed and good luck. It’ll be my third year this year; can’t wait!! 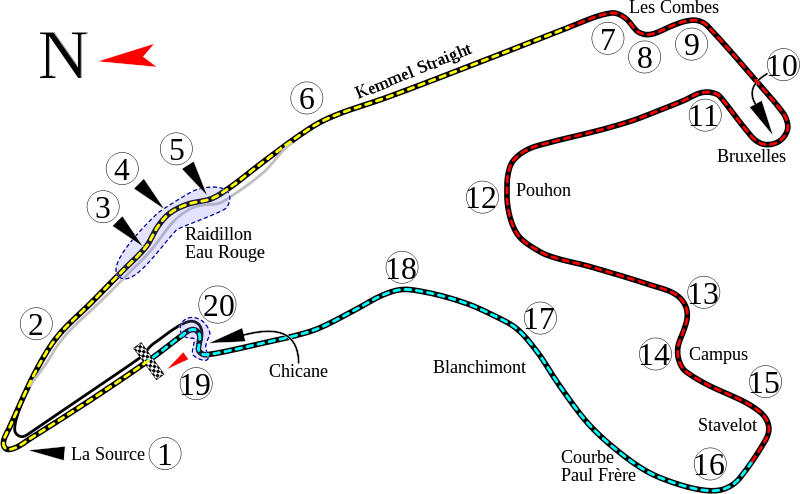 Really useful overview – I am trying to plan my first visit to Spa this year. I am actually staying in Verviers, but need (REALLY NEED) to be back at Calais by 10pm as I have to fly to America on the Monday (not brat planning!). Problem is that everyone says that getting out of Spa can be a nightmare, but you said you found parking and getting away really easy. Can you tell me a bit more about where you parked and which way you headed after the race as your departure sounded brilliant? My wife and I have been long-time watchers (she is a massive Button fan and I keep pestering her that it might be his last season…) but we’ve never made it to a live GP. This year we decided to buy tickets for Spa and work everything else out afterwards (camping, supplies, where to sit, etc.). Finding positive, let alone helpful, reviews of the Spa F1 GP is almost impossible. So very glad that I found this post and it has made us super excited to be going! Today we did some online shopping; camping chairs, cool bag, large umbrella, portable radio (apparently you can receive radio 5 live on track?) and binoculars. Now a Union Jack and a Belgian flag (I’m Belgium so it’s my home grandprix) and we’re good to go! Thanks for this. Out of curiosity, have you ever been to the British Grand Prix? No never; can’t really afford it! Am going back to spa this year though! Hi I booked Spa tickets for the whole weekend for my husband’s Christmas presents last year. Since then he has been very ill, but he’s not doing too bad now and is excited to do the trip. We plan to drive (me driving) and camp but would really like somewhere not too noisy. Out tickets are for ‘Silver 4 Bruxelles’, can you recommend somewhere please? If you are asking about accommodations especially with your husbands health we stayed in Hui at the Best Western. Excellent accommodations and the drive to the track was under 40 minutes to the southeast side if the track. Hi, great review and I’m doing the same except coming in by train. How far away is the nearest town from campsite for supplies? or is it easier to go from track? You mentioned you got supplies after qualifying, what town did you go to as although I’m partial to greasy burgers my wallet isn’t. Thanks a lot. Our train stops there so we’ll stock up on way to the campsite. This has been the only Clear and Helpful guide to doing the Spa GP. I just wanted to thank you for writing it up. I’m dragging my brother along for the 2014 race, I’ve done Monza once in 2009 but no other GPs since. I cannot wait. We’re driving from Glasgow–getting the tunnel to France and driving onto Spa, Gonna Camp at the elephant Campsite. Any other tips for the weekend? Hi Alan, I can’t think of anything else I’d add except that it’s a really good idea to take your own food. Also, we took camping chairs with us and never found anywhere we could actually place them (lots of people and the banks are quite steep, so we ended up carting them around the whole time. It’s well worth taking a walk through the woods in the centre of the track too! I am planning to attend the 2015 Belgium Grand Prix and looking to camp at Elephant campsite. What was your experience of the site this year? I was also wondering how much it cost for the weekend – the guy who runs it doesn’t appear to speak the best English when I tried to contact him! Decided last night to do Spa this year so googled hoping someone would tell me how to do it!! So Thank You!!! We do the AD F1 every year but thought we’d do an extra one so chose Spa. Just a quick question on the food aspect, you said you bought food and drink for Race Day, are you allowed to take in your own then? Hi ChelleL, we took our own food into the track and it wasn’t a problem, there wasn’t any bag searching and most people had picnics: a lot better and cheaper than the food inside the racetrack (unless you want to queue for a long time for very greasy fried things!) you are going to have an amazing time, it was such an experience! In your picture of eau rouge above we found ourselves in the very upper right portion of the pic at the top of the hill. We have a corresponding picture looking down the hill taken a few minutes earlier. Do you have any more pics taken that day maybe a few minutes earlier looking up at the hill? Very cool!! I’ve got more pics from that time, you’ll prob be on those too! Here is a pic looking down the hill probably taken a few minutes before the pic you took looking up the hill. I am thinking you are somewhere down by the small shell signs at the bottom of the hill. Thanks for sharing. Jim. Great review just what I was looking for think I’m going now next year! Thanks Timo, I had such trouble trying to find good clear instructions myself when I was planning to go. Have a great time, you’re going to love it! Hi Paffy85, This weekend I booked my tickets for this years 2015 F1 GP with BookF1. Camping at the Elephant campsite (strange name I know) and it’s supposed to be a short walk to the circuit with shuttles if you can’t be bothered to walk it. My mate didn’t fancy general admin tickets so we got tickets for the Spa grandstand but I would have not minded gen admin too much.